Kennys Vargas (pronounced KEN-ee)...wife, Marta...daughter, Kamila (7/8/14)...attended Luis Hernaiz Verone (PR) High School in Calle Autonomia, Canovanas, Puerto Rico, the sixth player from that school to play professionally. Played for Puerto Rico in the World Baseball Classic, hitting .222 (2-for-9) with one home run and two RBI ... Optioned from Twins spring training to Triple-A Rochester April 2 ... Had five different stints with the Twins ... Hit pinch-hit, two-run home run in ninth inning May 19 vs. Kansas City to tie the game 3-3; Twins would win 4-3 in 10 innings ... Tied career high with four hits June 13 vs. Seattle ... Hit two home runs for Triple-A Red Wings July 26 at Indianapolis ... Homered five times in first 17 games for Twins. A Hit .278 (49-for-176) as left-handed hitter and .185 (12-for-65) as right-handed hitter ... Hit 11 home runs despite playing in just 78 games for Twins ... Hit .253 (106-for-419) with 21 doubles, 20 home runs and 69 RBI in 129 games between Rochester and Minnesota ... Set career-highs in games (78), runs (33), hits (61), doubles (13), home runs (11) and RBI (41). Optioned from Twins spring training March 18 and began season at Triple-A Rochester. Named Twins minor league Player of the Week May 21, hitting .440 (11-for-25) with two doubles, four home runs, 10 RBI and six runs scored for the Red Wings. Hit third career minor league grand slam June 3 at Louisville...hit another grand slam June 15 vs. Columbus. Recalled from Rochester July 4 (Trevor Plouffe - disabled list). Hit first career pinch-hit homer July 7 at Texas. Named AL Player of the Week July 10, hitting .471 (8-for-17) with five doubles, three home runs, four RBI and six walks in six games; led the AL in slugging percentage (1.294) and on-base percentage (.609). Recorded first career two-homer game, homers coming from both sides of the plate August 11 vs. Houston; first was left-handed off Doug Fister and second was right-handed off Tony Sipp ...became fourth player in club history to do so, joining Roy Smalley (1986), Chili Davis (1992) and Ryan Doumit (2012). Optioned back to Rochester August 20. Played in 14 games for the Red Wings and was recalled again September 6. Set single-season career-high with 10th home run September 29 at Kansas City. Hit .378 (17-for-45) as right-handed batter and .168 (18-for-107) as left-handed batter with Twins. Combined to hit .232 (112-for-482) with 27 doubles, 25 home runs and 78 RBI in 143 games between Rochester and Minnesota. Made Twins Opening Day roster for first time in career and was Opening Day designated hitter, batting fifth April 6 at Detroit....Hit .248 (26-for-105) with three doubles, three home runs and 10 RBI for the Twins before being optioned to Triple-A Rochester May 19....Recorded two-homer game with four RBI for Red Wings May 22 at Norfolk (Game 1)....Recalled from Rochester June 8. A Hit first career walk-off home run June 18 vs. St. Louis, hitting a solo shot in the bottom of the ninth inning, giving the Twins a 2-1 victory... Recorded career-high four hits, including a home run and season-high four RBI June 22 vs. Chicago-AL....Appeared in 18 games for the Twins and was optioned to Double-A Chattanooga July 1....Named Southern League Player of the Week August 10, hitting .435 (10-for-23) with one double, two triples, three home runs, 10 RBI, seven walks and a .548 on-base percentage in seven games....Promoted to Rochester August 11...Named Twins minor league Player of the Week August 16, hitting .391 (9-for-23) with two doubles, one home run, eight RBI, nine walks and a .563 on-base percentage in eight games.... Recalled by Minnesota September 1 as part of September additions....Named first baseman on MiLB.com Twins organizational All-Star team. Was optioned to Double-A New Britain from Twins spring training March 9...Named Twins minor league Player of the Week May 4 after hitting .476 (10-for-21) with two doubles, three home runs, seven RBI and five walks in seven games...Hit .358 (38-for-106) with seven doubles, five home runs and 24 RBI in 29 May games...Hit six home runs with 20 RBI in an 11-game span June 6-19...Named Eastern League Midseason All-Star...Participated in the SiriusXM Futures Game at Target Field July 13 for the World Team; batted fourth and played first base, going 1-for-4 with a double...Hit .281 (100-for-356) with 17 doubles, 17 home runs and 63 RBI in 97 games for the Rock Cats and was recalled July 31 when the Twins traded outfielder Sam Fuld to Oakland...Made major league debut August 1 at Chicago-AL, batting sixth and playing first base; recorded first career hit with two-RBI double off Chris Sale...Hit first career home run August 5 vs. San Diego, a three-run shot off Jesse Hahn...Recorded multiple-RBI five times in first 15 games (through August 17), making him the first player in club history to do so...Set season-high with five RBI August 23 vs. Detroit (Game 1). AThrough games of August 23, had 22 RBI in 21 games, the first rookie to have as many in such few games since Albert Pujols also had 22 in 2001...Hit .309 (38-for-123) with seven doubles, four home runs, 24 RBI, 17 runs scored, 11 multi-hit games, hitting safely in 24 of 29 games in August...the 24 RBI were tied with Trevor Plouffe for third most in the AL and tied for fifth most in baseball...38 hits were tied for third most in the AL...Among rookies in baseball during August, he ranked first in RBI, tied for second in hits, tied for third in runs and, sixth in batting average...Among Twins all-time rookies, the 24 RBI tied him with Gary Gaetti (July 1982) for second most all-time for any month (record held by Jimmie Hall, 27 in August of 1963)...Recorded 38 hits in August, paired with Danny Santana's 41, totaling 79, the second most in Twins history for two rookies in one month, trailing only Bernie Allen (44) and Rich Rollins (40), who combined for 84 in August of 1962...Set season-high with eight-game hitting streak August 29-September 5, hitting .314 (11-for-35) with eight RBI during the streak...Through games of September 3, he had 43 hits and 31 RBI in just 32 major league games; according to Elias, prior to Vargas, the most recent players who registered at least 40 hits and 30-or-more RBI in so few games into their careers were Albert Pujols (40/30 in his 29th game) and Joe DiMaggio (52/32 in 28th game)...Recorded 38 RBI from August 1 through end of season, tied for fourth most in baseball since that date through the end of the season and tied for seventh most in baseball...Led all rookies in baseball post-All-Star break in RBI (38), tied for sixth in hits (59), and tied for seventh in doubles (10)...Recorded 5.66 RBI-per-at-bat ratio, the second highest in Twins history for a rookie (min. 150 at-bats), trailing Brian Buscher (4.64 in 2008)...Given the Sherry Robertson Award for Twins minor league Player of the Year. Spent season with Single-A Ft. Myers...Hit .313 (30-for-96) with eight doubles, eight home runs, 30 RBI and 15 walks in 28 May games...Hit .361 (30-for-83) with nine doubles and 18 RBI in 23 June games...Named Florida State League Mid- and Postseason All-Star...Recorded second career two-homer game and career-high six RBI July 27 vs. Clearwater...Recorded 93 RBI, the most in the Florida State League and seventh most among all Single-A players...93 RBI marked the most for a Miracle player since Erik Lis had 97 in 2007...Tied for second in the FSL in home runs (19)...Hit .282 (42-for-149) with nine doubles and five home runs from the right side and .260 (80-for-308) with 24 doubles and 14 home runs from the left side...Added to Twins 40-man roster November 20. Spent season with Single-A Beloit...missed the Snappers first 99 games, serving part of a 50-game MLB drug suspension from August 11, 2011...hit two home runs in first game July 22 vs. Great Lakes...homered six times in first nine games July 22-31, including second professional grand slam July 28 at Peoria...reached base safely in final 22 games August 12-September 3, including a 12-game hitting streak August 12-24...named Twins minor league Player of the Week August 24, hitting .429 (12-for-28) with one double, one home run, five RBI and four runs scored in seven games...hit .296 (8-for-27) with no home runs and five RBI from the right side and .323 (41-for-127) with 11 home runs and 31 RBI from the left side. Spent entire season with Rookie Elizabethton...homered in first two games June 21 and 22 vs. Bluefield...hit safely in season-high 10 straight July 1-14, hitting .432 (16-for-37) with 15 RBI and a .488 on-base percentage in that span...suspended for 50 games August 11 for violating MLB's drug policy...hit .349 (15-for-43) with three extra-base hits from the right side and .313 (41-for-131) with 14 extra-base hits from the left side. Spent entire season in Gulf Coast League...named GCL Postseason All-Star...hit .383 (36-for-94) from the left side and .208 (10-for-48) from the right side...led team in batting average (.324), RBI (26), doubles (15) and slugging percentage (.507), second in games (39) and third in at-bats (142)...finished second in Gulf Coast League in doubles. Spent first professional season with GCL Twins...hit first professional grand slam and home run in second career game June 28 at GCL Rays...hit .333 (6-for-18) with two homers from the right side and .242 (22-for-91) with one home run from the left side. November 14, 2018 1B Kennys Vargas assigned to Indios de Mayaguez. November 13, 2018 Aguilas Cibaenas placed 1B Kennys Vargas on the reserve list. 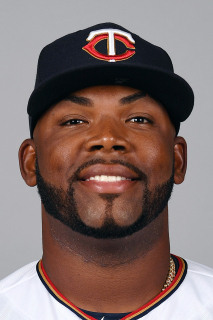 November 2, 2018 Rochester Red Wings released 1B Kennys Vargas. October 13, 2018 1B Kennys Vargas assigned to Aguilas Cibaenas. March 27, 2018 Minnesota Twins sent 1B Kennys Vargas outright to Rochester Red Wings. March 24, 2018 Minnesota Twins claimed DH Kennys Vargas off waivers from Cincinnati Reds. March 22, 2018 Cincinnati Reds claimed DH Kennys Vargas off waivers from Minnesota Twins. March 16, 2018 Minnesota Twins designated DH Kennys Vargas for assignment. January 25, 2018 1B Kennys Vargas assigned to Cangrejeros de Santurce. January 5, 2018 1B Kennys Vargas assigned to Indios de Mayaguez. August 21, 2017 Minnesota Twins recalled DH Kennys Vargas from Rochester Red Wings. August 10, 2017 Minnesota Twins optioned DH Kennys Vargas to Rochester Red Wings. August 9, 2017 Minnesota Twins recalled Kennys Vargas from Rochester Red Wings. July 18, 2017 Minnesota Twins optioned DH Kennys Vargas to Rochester Red Wings. July 7, 2017 Minnesota Twins recalled Kennys Vargas from Rochester Red Wings. July 4, 2017 Minnesota Twins optioned DH Kennys Vargas to Rochester Red Wings. June 7, 2017 Minnesota Twins recalled Kennys Vargas from Rochester Red Wings. May 29, 2017 Minnesota Twins optioned DH Kennys Vargas to Rochester Red Wings. April 23, 2017 Minnesota Twins recalled Kennys Vargas from Rochester Red Wings. April 3, 2017 1B Kennys Vargas assigned to Rochester Red Wings. April 2, 2017 Minnesota Twins optioned Kennys Vargas to Rochester Red Wings. March 31, 2017 1B Kennys Vargas assigned to Rochester Red Wings. January 14, 2017 1B Kennys Vargas assigned to Aguilas Cibaenas. September 6, 2016 Minnesota Twins recalled Kennys Vargas from Rochester Red Wings. August 20, 2016 Minnesota Twins optioned 1B Kennys Vargas to Rochester Red Wings. July 4, 2016 Minnesota Twins recalled Kennys Vargas from Rochester Red Wings. March 18, 2016 Minnesota Twins optioned 1B Kennys Vargas to Rochester Red Wings. January 30, 2016 1B Kennys Vargas assigned to Puerto Rico. September 1, 2015 Minnesota Twins recalled Kennys Vargas from Rochester Red Wings. August 11, 2015 1B Kennys Vargas assigned to Rochester Red Wings from Chattanooga Lookouts. July 2, 2015 Minnesota Twins optioned 1B Kennys Vargas to Chattanooga Lookouts. June 8, 2015 Minnesota Twins recalled Kennys Vargas from Rochester Red Wings. May 18, 2015 Minnesota Twins optioned 1B Kennys Vargas to Rochester Red Wings. October 29, 2014 1B Kennys Vargas assigned to Indios de Mayaguez. October 29, 2014 Indios de Mayaguez activated 1B Kennys Vargas. October 29, 2014 Indios de Mayaguez placed 1B Kennys Vargas on the reserve list. July 31, 2014 Minnesota Twins recalled Kennys Vargas from New Britain Rock Cats. July 10, 2014 New Britain Rock Cats activated 1B Kennys Vargas from the temporarily inactive list. July 7, 2014 New Britain Rock Cats placed 1B Kennys Vargas on the temporarily inactive list. March 9, 2014 Minnesota Twins optioned 1B Kennys Vargas to New Britain Rock Cats. January 29, 2014 1B Kennys Vargas assigned to Puerto Rico. November 20, 2013 Minnesota Twins selected the contract of Kennys Vargas from Fort Myers Miracle. October 31, 2013 1B Kennys Vargas assigned to Indios de Mayaguez. April 1, 2013 Kennys Vargas assigned to Fort Myers Miracle from Cedar Rapids Kernels. March 27, 2013 1B Kennys Vargas assigned to Minnesota Twins. July 22, 2012 1B Kennys Vargas assigned to Beloit Snappers from Elizabethton Twins. August 11, 2011 Kennys Vargas roster status changed by Elizabethton Twins. June 20, 2011 1B Kennys Vargas assigned to Elizabethton Twins from GCL Twins. June 16, 2011 GCL Twins placed 1B Kennys Vargas on the reserve list. November 11, 2009 1B Kennys Vargas assigned to Indios de Mayaguez. June 23, 2009 Minnesota Twins signed 3B Kennys Vargas. June 23, 2009 1B Kennys Vargas assigned to GCL Twins.